As an expert in understanding and defining the cult mentality, David Conn manages, through logic and his strong faith, to explain the inability, or the refusal, of many scientists to separate the spiritual self from the scientifically driven self (in other words, "to bifurcate"). This, he boldly says, is their real path to illumination, to Jesus Christ, the only source of Truth, the creator not only of science, but of the entire universe. Mr. Conn bolsters his case by way of an inarguable and mathematically proven truism. 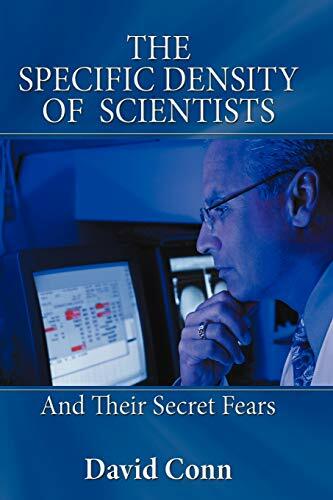 In his latest book, THE SPECIFIC DENSITY OF SCIENTISTS, Mr. Conn deals with the cult mentality that has invaded the realm of science and scientists. He explains four major concepts that the “unbifurcated” wing of science has either refused to consider or has fearfully and illogically swept aside. He exposes the weakness of the “unbifurcated” scientists, their minions, and the growing majority of a general population who, having themselves been infused with unscientific “scientism,” see to it that their children, their students, their spouses, and their friends, are also steeped in it. This errant scientism is a mentality that people are unaware of, but that flows in and out of them in torrents – through public institutions, workplaces, artistic expressions, and social networks – until it reaches a remarkable status of being something that “Everybody knows and believes”! Four major concepts in THE SPECIFIC DENSITY OF SCIENTISTS were introduced in Mr. Conn’s last book, the Christian science fiction novel, LEDNORF’S DILEMMA. One of these concepts, Grath’s Paradox, is a Terminal Corruption Hypothesis. It is tenuous, at best, as analysts attempt to discern whether the United States has or has not reached the point of no return. In this latest book, Mr. Conn says: If the point of no return has not been reached, the only hope for a healthy realignment lies with America’s intellectual community and its general citizenry coming to understand that scientists and other intellectuals are wrong to think their brains and education give them special advantages in determining whether or not God exists and participates in the lives of His people. The masses, therefore, should no longer be swayed by scientists who have no special authority in these spiritual matters. It is critical that they pursue the one source of Truth with all their hearts, souls and minds. David Conn was for ten years a lead analyst with Chevron’s big environmental laboratory and then joined the Department of Defense as a Quality Control Representative, a liaison among several Naval and Air Force bases and the Defense Department, performing surveillance over chemicals and fuels and the occasional fueling of Air Force One. Aside from LEDNORF’S DILEMMA, David Conn also co-authored THE CULT THAT DIED (G. P. Putnam's Sons, New York, 1980).